In the midst of picking up, loading, and unloading over 12,000 cookies today in preparation for our deliveries for the officers in the Greater Cincinnati area, I read your column titled “Prescott police deserve better than uncertain future”. I finished my very long day of work and before heading into the next task at hand I decided to take a moment to write to you. I am sure I will be up into the wee hours of the morning anyway preparing for our silly cookie delivery that is sure to only add to the waistlines of those who protect us daily; so a few more minutes of my time is nothing. While you sleep, thousands across the US are working to get their deliveries ready and making sure those added touches of #sweetkindness are all in place. While you sleep, we are up worried about our loved ones. Worried not just about their pay and the bills in the mailbox but about their safety, their worries, and their stress. In case you haven’t noticed, Ms. Denis, it’s quite a different world lately and our officers are under attack. Sadly at times, that extends to those who sit behind a keyboard and carry the title “freelance journalist”. What you seem to miss is that our officers don’t just need a nice paycheck that can offer a means of support for their families. They need a public who cares. A public who appreciates them and a public who, when the world is filled with such ugliness, is willing to do whatever they are able to in order to say “we support you”. I might also add, it is not just the officers who need this. It is their loved ones as well. Those very loved ones who are baking cookies and expanding waistlines. What you seem to miss is that while it is just a silly cookie to you, to these officers, it is a coordinated effort that actually uplifts and is not revolving around a message of hate. You see a silly cookie; we see support. You see a silly cookie, we see kindness; something this world needs so greatly. Support is not just support when it comes in the manner in which Ms. Denis, Freelance Journalist, sees fit. Support is support and sometimes when people feel at a loss in how they can support, something as simple as a silly cookie can be a game changer. Have you ever noticed that when you give a person a cookie, they smile? Something so small, so everyday, so silly, is able to bring such joy to a person. Mock our cookies all you want but please know that we are set to deliver over 100,000 (ONE HUNDRED THOUSAND) cookies this week to officers and their support staff in 27 states. While this won’t help pad their wallet, I am betting it will do much more for their moral than your freelance column. I wish you a moment of kindness in your day and a cookie to bring a smile to your face as well. Heck yes!!! Thank you for standing up for our Prescott girls who are sending out over 1k cookies!!! We love you! Thank you, Becky for taking the time to write this! Prescott will get the most amazing cookies ever, I will make sure of that. And we’ll send lots of pics to Ms. Denis!!! Thank you for writing to Ms. Denis and giving her our point of view!! This is fantastic!!! Thank you for taking the time out of your busy schedule to write this letter, Becky. I will never forget how one of my Sergeant’s visibly choked up when we brought in the boxes of cookies with the hand drawn messages from your children. The simple act of #sweetkindness that is shown to officers when their morale is down in such hostile and uncertain times as these is priceless to our men and women that are risking their lives for their communities. God truly has blessed this Earth with Angels who have helped Cookies for a Cop by baking, delivering, organizing, praying, and simply showing support. 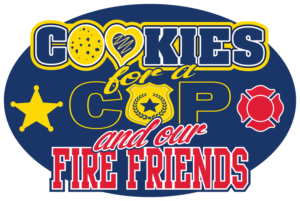 No, it’s not JUST a cookie….it’s a community that has come together and shown their support for those that need it the most. Ms Denis can think and say what she wants just as we can think and say and show support anyway we want. What she doesn’t realize is that an officer didn’t take this job for the money, because they certainly don’t make enough for the risk they take each shift, but they took it to serve and protect the community. The community wants to give back to them so they know they are appreciated and loved. So these SILLY COOKIES will be delivered with more than love and appreciation to the officers in our cities, towns and communities than she will ever understand. So proud and excited to be part of this act of # sweetkindness. Thanks for organizing it all Becky. You deserve a couple cookies too!! Well, I haven’t read that article but I got the gist of it. It is people like this person that makes what we do even more important. To show #sweet kindness to these officers and staff, was SO heart warming to EVERYONE involved!!! Those who gave and those who received!!! I KNOW that the ones we served were SO happy to see us and to hear what our actions as well as our words were saying! We care, we love you, we pray for you, we support you, we are here for you ! There are WAY more people showing #sweet kindness than there are negative nillies!! So, she can stay in the minority if that’s what she choses , we will stay positive!!! She may not know that it is NOT just a cookie, we will work and deliver goodies ALL year ! IT IS NOT “JUST A COOKIE”! The one day is so the nation will see that there are people out there doing all we can to show the officers # sweet kindness, and so the nation can be made aware of the organization, this way if you want to help , HEY, come and help!!!! Thanks to Becky for your efforts , if not for you we would not have evolved to the national organization we are.